Thinking of buying a rental property? 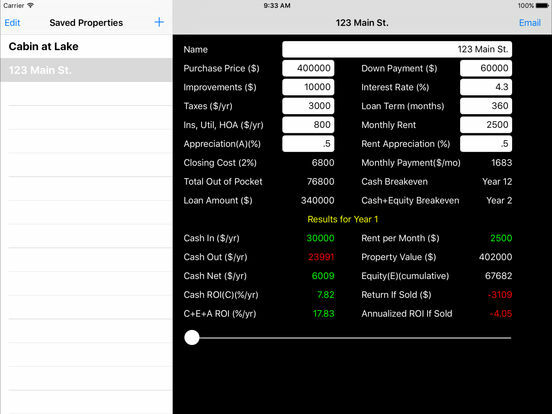 This App will estimate yearly ROI calculations based on the specifics of the property and loan. Quickly view calculations for each year, up to 30 years, by using the slider control. The following inputs may be specified: Purchase Price, Down Payment, Improvements, Interest Rate, Loan Term, Taxes, Other Annual Expenses, Appreciation, Rent, Rent Appreciation. 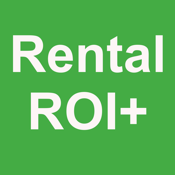 Rental ROI Plus will automatically calculate: Closing Cost, Total Out of Pocket, Loan Amount, Monthly Mortgage Payment, Monthly Rent, Annual Cash Flow, Cash In, Cash Out, Cash Net, Cash ROI, Cash plus Equity plus Appreciation ROI, Property Value, Accumulated Equity, Return If Sold, and Annualized ROI If Sold for a given year. Rental ROI Plus includes some calculations that were not part of the original Rental ROI application. In addition, you can see 30 years of calcuations, instead of 20 years. The application is intended to provide an estimate of actual returns, and is not intended to be an exact calculation. For example, dollar amounts do not include cents. Includes automatic saving of properties. Properties can be edited, deleted, and emailed.